The urge to start blogging bout this in the middle of the night. halfway through CTs. Probably no one would read this so it's such a great place to be emptying thoughts. Came across this quote, felt like it really applies to how i feel right now. Okay, maybe not. 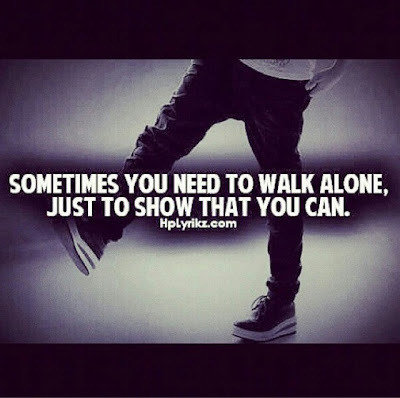 But having to think of walking alone this way just seem like a more optimistic way. Have been feeling really depressed lately, so most of my day just ends up being solitary at some corner in the library. Find myself starting to isolate from everything. Pushing myself away from people by choice.And starting to think where the past me went to, where did the happy optimistic life i had disappeared to. Depression maybe, symptoms mentioned seemed to be spot on but hopefully not. But i guess it doesn't matter anyway. Everything coming at once is just so annoying.